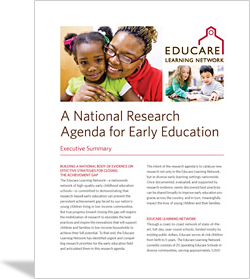 We created a National Research Agenda for Early Education to share the pressing early learning priorities we have identified and catalyze new research in best practices for early education that improve the lives of young children and families in poverty. In particular, we call for research that explores four domains of practice: data utilization, embedded professional development, high-quality teaching practices and intensive family engagement. Evidence suggests these four practice domains are active ingredients in preparing young children to succeed in school and life. Our research agenda offers the opportunity for researchers, community organizations, schools and families to work together to build knowledge about effective practices that improve the lives of low-income young children and their families. We invite others to join us in exploring questions about how to provide the highest quality early learning and life experiences for children from birth through age five. To join us or ask questions about the research agenda, please contact Tony Raden, senior vice president, research and policy initiatives at the Ounce of Prevention Fund at araden@ounceofprevention.org. 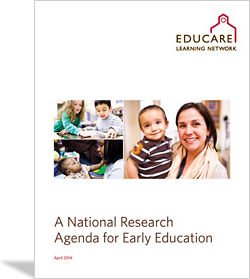 Read the complete National Research Agenda for Early Education.